•Current state of affairs in B2B insurance claims payments (personal lines) i.e. what are the current mechanisms? How do they work? •What are the solutions to save insurers money, increase efficiency and security? •If there are better technological solutions, why are outdated methods of payments still so entrenched? •What can insurance firms do next to enhance their B2B payments propositions? As the (re)insurance industry evolves to keep up with an ever changing world, innovation is becoming more relevant than ever. Cyber breach and crime is at an all-time high, the Internet of Things and the connected home are becoming commonplace, and we are on the cusp of seeing advancements like driverless cars come to fruition. In addition, soft market conditions, geopolitical uncertainty and the weakening of global powerhouses are multiplying the need to transform. This Global Reinsurance webinar, held in association with Swiss Re, will urge listeners to implement knowledge and turn it into practice. We’ll take a deeper dive into solutions to help the industry transform and grow – not just what works, but what has the most impact. Nearly half of all cars will have advanced driver assistance systems (ADAS) by the end of the decade – systems which can autonomously drive vehicles for extended periods, break and slow automatically to avoid danger and alert drivers to nearly every conceivable hazard. But these systems require costly maintenance and repair, with the windscreens being vitally important as the cameras need recalibrating. What should car manufacturers and insurers being doing to ensure good customer outcomes? How can insurers manage the increasing cost of severity claims to fully take advantage in the drop in frequency claims? These are some of the issues that will be explored in this not to be missed webinar. * How can the insurance industry keep costs low when repairing vehicles with ADAS technology? * How can insurers improve customer service when repairing vehicles with ADAS technology? * What are the current significant risks insurers face with the windscreen replacement and recalibration? * How can insurers manage their risks effectively? * In terms of good customer outcomes, how can insurers cushion the blow of customers paying for expensive windscreen repair and recalibration and then recouping the costs from the insurer? * If there is an accident that is potentially the fault of the ADAS, what certainty can insurers have that the motor manufacturer will hand over the data? * What are the latest technologies in ADAS being released that insurers should be aware of and how will it impact their business? More than two months on from the historic referendum which saw the UK public vote to leave the EU, ‘uncertainty’ remains the watch-word. 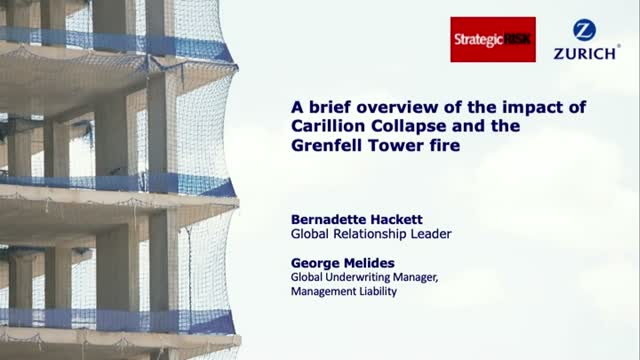 In this webinar, presented by Global Reinsurance and Debevoise & Plimpton LLP, we discuss what we have learned so far, and what the burning issues are for the reinsurance world to look out for. How has the market reacted to Brexit? What are the prospects of the UK achieving equivalence as a jurisdiction once it’s left the EU framework? Could the UK rely on WTO rules after it’s left the EU? What are the other possible post-Brexit trading models? What are the opportunities for reinsurers, capital providers and others in the new framework? These questions, and more, will be addressed during the webinar. Uncertainty is a constant theme in the reinsurance industry, especially in disaster-prone regions for which detailed exposure data is lacking. How can re/insurers make meaningful risk assessments and write more business in these areas? This GfK webinar answers this question by showing how CRESTA zones can be used to estimate exposure for aggregated risk portfolios in rapidly emerging markets. JBA Risk Management offers a behind-the-scenes look at how to assess flood risk at the CRESTA level in the absence of detailed exposure data. With a focus on the Asian markets of Thailand, Malaysia, and China, the webinar provides a template for using GfK’s CRESTA boundary data as part of an approach to estimate risk in markets that lack detailed exposure information. The webinar is hosted and moderated by Global Reinsurance and includes presentations by Iain Willis, Technical Director at JBA Risk Management; Christopher Guider, Marketing Manager at GfK; and Christine Werner, Senior Consultant for Financial Services at GfK. With the total financial impact of storms Desmond and Eva still unclear, it is obvious that construction companies across EMEA can still improve their flood risk mitigation strategies. Join StrategicRISK and Zurich Insurance for a webinar on May 12 at 9am BST which looks at both natural and man-made flood risks. With the ever-growing threat of cyber incidents on global corporates and new developments on the horizon in this rapidly evolving industry, stakeholders need to maximise their knowledge of the market in order to safeguard their businesses. -Insurance Times - the market-shaping brand in UK General Insurance. -Pensions Insight – a must-read for all UK pension schemes and their professional advisers. -GR - the voice of international (re)insurance. -Engaged Investor - the practical, educational brand for pension fund trustees, scheme managers, corporate officers, financial and HR directors and investment professionals. -SR - the only brand that comprehensively covers risk management , corporate governance and more for the UK, European and Asia Pacific markets. -Reward – indispensable for all HR directors in the employee benefits sector.